Winter lingered far too long this year. It was cold, it was blustery, and many of us were left wondering if it would ever end. Now summer is here – and it’s time to get outdoors. In fact, outdoor spaces are the No. 1 desired amenity by homebuyers, according to a 2011 National Association of Homebuilders (NAHB) study. Second on that list is a fireplace. 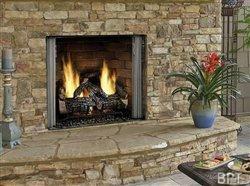 And according to the 2011 Marshall & Swift Residential Cost Handbook, outdoor gas fireplaces can add $ 3,500 on average to home values.